The Creative Place: Growing Seeds. Remember how we planted seeds about a week ago? Well, we already have some HUGE seedlings (those tall things are bean plants). It has been so fun to watch them grow and I swear the beans grow about a ½" a day. 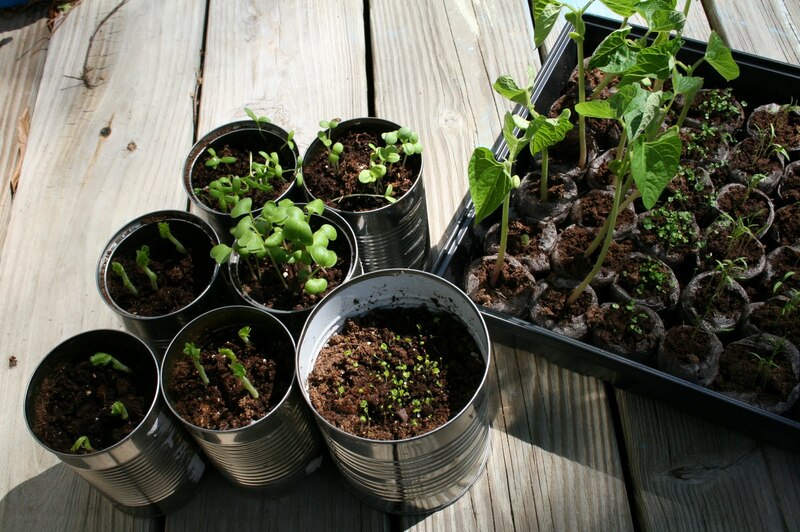 We are getting ready to transplant them to cans with sticks (so they can climb) because it is still much too cold at night to transplant them to the outside. My awesome hubby made a huge planter box to fit up next to our home (the only place on our entire property that receives enough sunlight - we have tons of trees!) this weekend. We can't wait for the seedlings to get big enough (and for it to get warm enough) to transplant them outside. Yay for fresh produce on the horizon. That is, unless I accidentally kill the plants before they can produce fruit ;) Hopefully not.